Little Sweetie created the following newspaper as a school project. Augusta Byron invents programme for Babbage’s Analytical Engine! The impossible is possible! Lady Augusta Byron has invent a punched card able to show the Analytical Engine what numbers to calculate. So pack your bags, by a ticket to London, and stop by at Charles Babbage’s house to see the famous Analytical Engine and Enchantress of Numbers! One of Babbage’s master pieces. He manages to enchant us once again with this amazing invention. But will the inventor be able to outdo himself next time? Will he still be able to make us say, “Babbage, you have outdone yourself once more!”? Or will we glance at his next invention and yawn, knowing that his last invention is the best? Find out in person, at Babbage’s laboratory! CONGRATULATIONS, Lila Simchen! You won the “How many parts does it take to build an invention that is 5 feet tall and 8 feet wide?” contest! Please see the writer of this article for your prize! Plus, you get two free tickets to see Charles Babbage and Augusta Byron at their workshop, in person! Each hole corresponds to a number on a chart that the Analytical Engine has programmed into it. But the problem is, it is improbable! A machine that can do mathematics?! Just by looking at holes on cards? Well, hate to break the tension, but it IS possible! This is the very wonder we’re capable of with the advanced technology we have today. Welcome to Interview Weekly! I am Sweetie (S) and today I am interviewing Lady Augusta Byron (LAB). S: Hello folks, and welcome to Interview Weekly! Today I’m interviewing the daughter of the daredevil, Lord Byron, Augusta Byron! LAB: You can call me Ada. S: Pleasure to meet you, Ada! My name’s Sweetie. LAB: Pleasure to meet you, Sweetie. S: So tell me, Ada, how did you come across Charles Babbage in the first place? LAB: Well, I heard about the Difference Engine and the Silver dancer when I was young. I asked my mother if I could go, but she’s a fun wrecker. S: They all are, these days. L+LAB: Ha, ha, ha, ha! LAB: Right you are! Anyways, I just had to go see the Silver Dancer, I wanted to see how mathematics could make such precise movements, at such precise times. S: Eventually, you got your mom to say yes? LAB: Right. So I went with one of my… (counts on fingers) Oh, I have so many tutors! Well, she sent Mary Somerville to take me to see it. And a man invited me to see a machine he built. 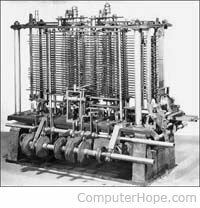 And I realized that man was Charles Babbage! S: Wow, great story, Ada! So, tell me, what got you into mathematics? LAB: Well, my mom wanted me to be smart, so she hired a bunch of tutors to teach me. And now, look at were I am, on the chart of fame! S: You certainly are top notch, Ada. Any man would be lucky to have you. S: Anyway, what is your biggest secret? LAB: My biggest secret? Oh. Well, I never got to see any portrait or poem or picture of my father until I was 21. What’s your’s? S: (Whisper) I’m from the future! S: I’m from the future. Sweetie beams up, into the Enterprise (from Star Trek).